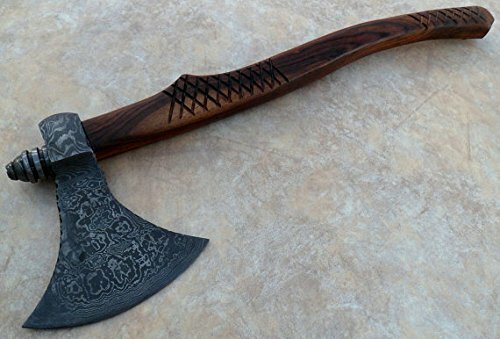 The historically-inspired Viking Hand Axe is a design collaboration between Lynn C. Thompson, and custom bladesmiths Dave Baker and Rich McDonald. 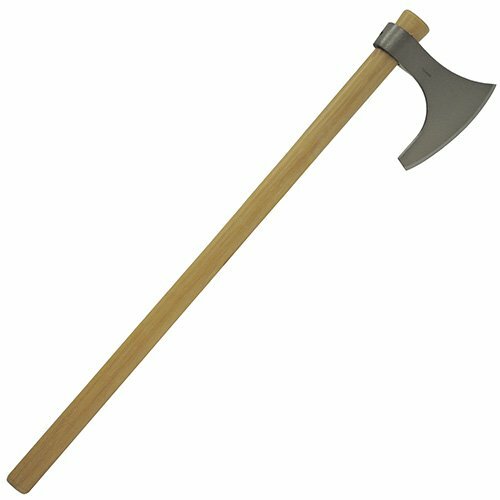 The stout 30" American Hickory handle, extra broad and sharp cutting edge, hooking “beard”, and up-swept thrusting “horn” combine to make a formidable fighting axe that would be the pride of any Viking’s collection! 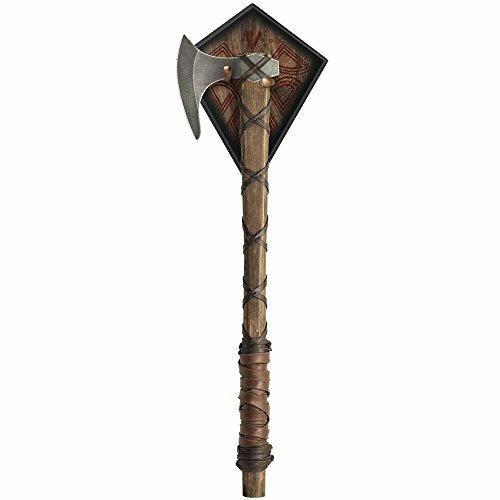 A Cor-Ex™ sheath, which is sold separately, is available for the Viking Hand Axe. This is a very nicely made Medieval Crusader Sword Overall length is approximately 42", the blade measures approximately 28" in length. Package weights approximately 5.5lb. 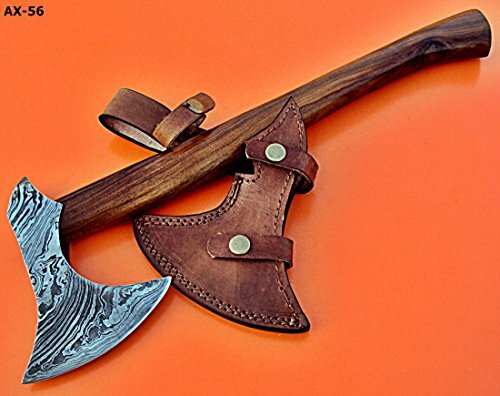 Drake off road tools damascus steel axe with rose wood handle. 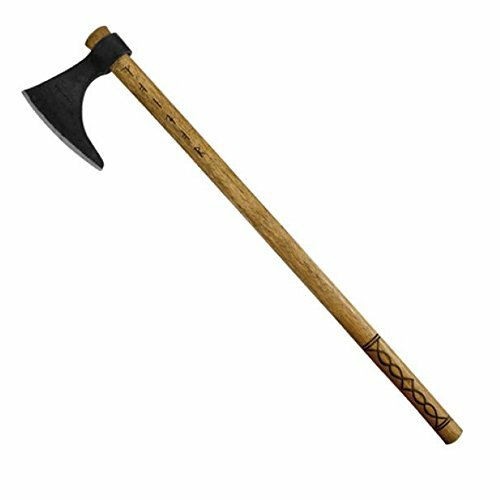 Simple and classic, with easy grip.Beautiful hand forged pattern axe head. 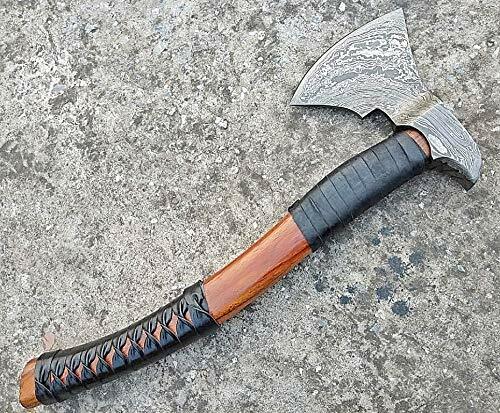 Axe head length 06:.50 inches working edge 04:60 inches handle length, 17.60 inches blade the blade is made by 1095/15n20 alloy steels (176 true layers) hand forged to beautiful pattern. Damascus steel of this knife has high quality contents to give an excellent edge and sharp cutting abilities. Hardness of the blade of this knife is hrc 58-60 in the lab & been hand sharpened to a sharp edge. Buying you must be sure and certify that you are 18+ of age and you are able to legally purchase and own an item and will use it responsibly. 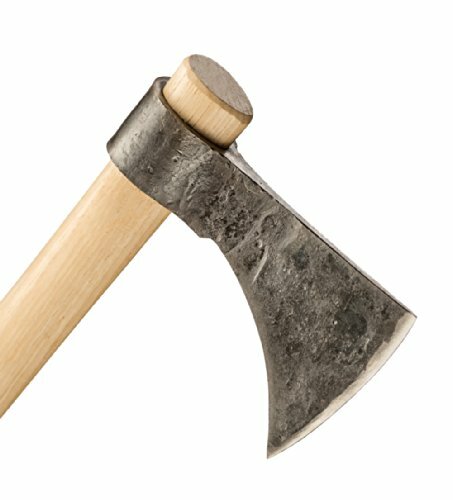 The Axe head on the Condor Tool & Knife Valhalla battle Axe is made from forged 1060 high carbon steel and is heat treated and annealed to about 50-55 Rockwell hardness. The natural finish is a bare metal look that has the appeal of a well-worn pair of jeans. This finish is a perfected process of hand hammering and gives a classic and enhanced look to an already well-made tool. The craftsmen at Condor use hand powered equipment to achieve this traditional pattern to give it a look as if it was hand forged over 200 years ago. 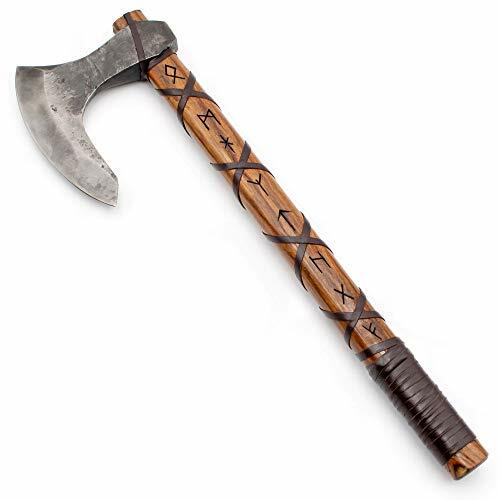 The burnt American Hickory handle is strong and gives the Axe an ancient look when paired with the Viking design work. The included sheath is made from high quality, heavy duty, handcrafted Brown leather. KNIFE DESIGN This incredible design of knife is 100% fully hand forged. This is a piece of true craftsmanship. The knife is constructed with a full tang handle and is made from high quality carbon steel. The impressive blade comes semi-razor sharp, so it can be used in a variety of ways. The medieval production features an artful raven's head hilt and an antique patina blade. 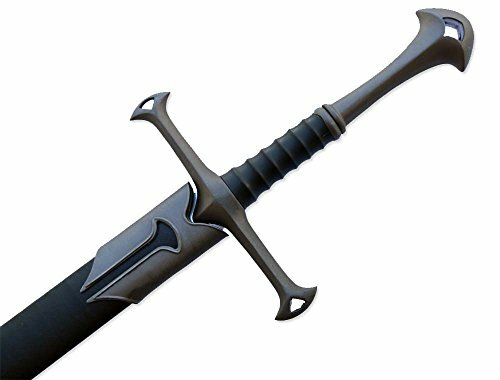 Hilt is bound with cowhide pure leather and comes with a beautiful, cowhide sheath with belt loop. 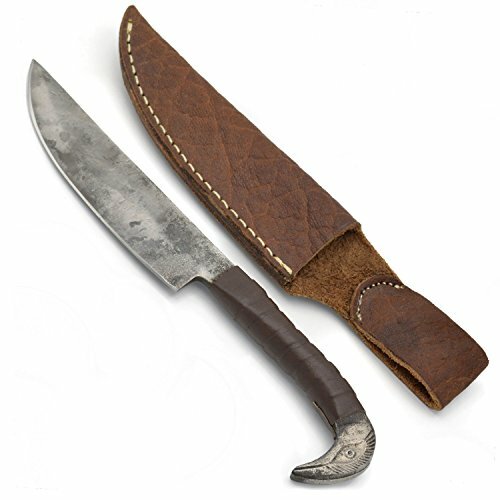 DIMENSIONS: Overall Length: 27.94 cm Blade Length: 16.51 cm Handle length: 11.43 cm Hardness of Knife: 56-58 HRC Accessories: Pure cowhide leather sheath CARE TIPS: Knife blade should always be clean and treat with oil after use. DISCLAIMER: We commit not to sell knives to anybody that is under age 18. Buyer is responsible to check the laws in his/her local state, city or country. 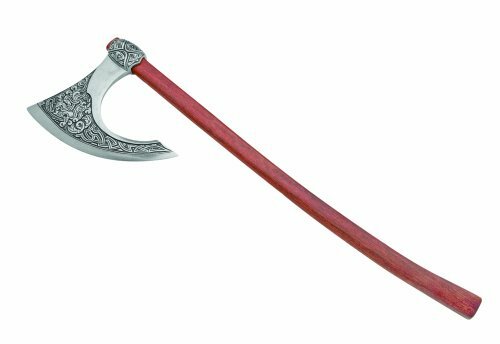 The weapon favored by Ragnar Lothbrok, this axe was essential in Ragnars rise from farmer to Earl, and from Earl to King. Guided by Oden and believing that his path was destined for greatness, Ragnar and his warriors raid and pluder accross England and beyond. 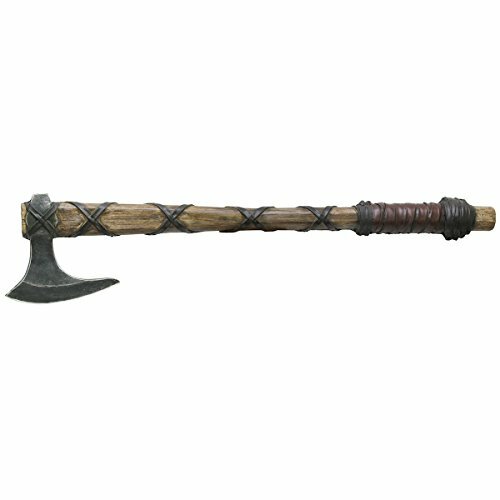 This axe was used in all his raids, and was the key to his victory over Earl Haraldson in the epic season one battle. 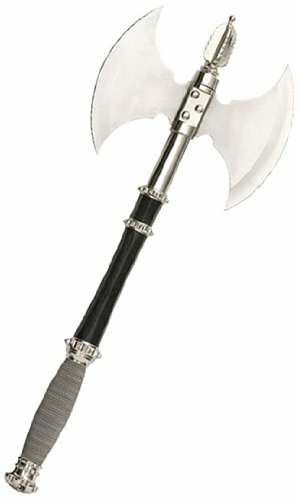 Ragnar’s favored axe is rarly far from his side. 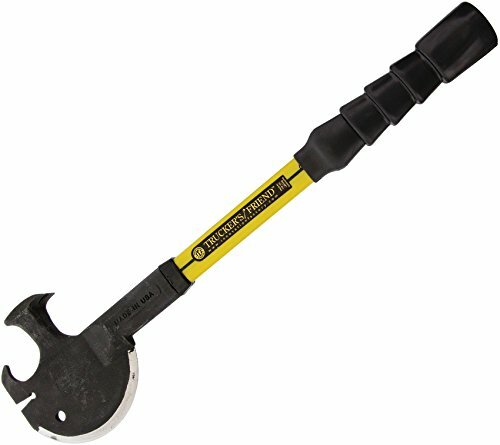 Hero's Edge Foam Battle Axe, 36"